Why is Boulder one of the top 100 best places for Assisted Living facility? Boulder is a unique combination of a small college town and a cosmopolitan city with almost unlimited amenities and attractions. It is a health conscious community with great resources specifically designed for seniors like the Boulder Group of Peer Counseling For Seniors. With about 100,000 residents, Boulder offers seniors the options of a large congested city with the intimacy of a secluded mountain town. The area boasts great weather, natural surroundings, a variety of transportation options, and some really nice attractions, a college atmosphere, festivals, great health care and progressive health options. Since Boulder’s original settlement has been known as a haven for those with heath issues and respiratory ailments. The dry clean mountain air can do wonders for people with mold allergies. Even more important is that the city of Boulder passed a law prohibiting smoking cigarettes in public spaces. This means you can enjoy a meal or beverage anywhere in Boulder and not have to worry about being polluted by some else‘s addiction. On the downside, Boulder does get snow 10 to 20 times each winter and this can make driving very difficult for some one who is in assisted living. The good news is that it is usually snow and not ice. It also usually only stays on the ground a short period (not all winter) because there are warm (40-50 degrees) days even in December and January. A good 4-wheel drive will never leave you stranded. The city also has a law that sidewalks must be cleared so it is safe for assisted living residents to go for a walk shortly after a snow. The area is well known for having over 300 blue sky days every year. Any bad weather moves in and moves out quickly. The abundance of sunshine is excellent for seniors that may have problems with depression. Boulder never has periods of weeks where the sun doesn’t shine like in parts of the South and Midwest. Because Boulder is nestled against the Rocky Mountains, it is a great place for wildlife viewing including deer, foxes, coyotes, and elk. The area is also rich with areas for bird watching. Many migratory birds travel through the area and many bird make Boulder their home including humming birds, hawks, and occasional eagles. Boulder is surrounded by green space so there are parks in every direction. From Chautauqua Park at the base of the Flatirons to the Boulder Reservoir in the North, there are both large and small parks everywhere. Of course almost every day begins and ends with an amazing sunset that will remind you why are alive. For those assisted living residents, Boulder has an extensive system of safe public transportation. The local buses are named The Hop, Skip and Jump. These buses are very popular with the students and they are a great option for senior who can’t drive. The pedestrian and bike trail system extends in the north-south and east-west directions. The Boulder Creek trial can take you through the downtown area, through much of the CU campus and up into Boulder canyon without ever crossing a street. Located in the foothills, seniors have access to the mountains but live in a relatively flat area that is usually easy for driving. Call-a-ride is a smaller bus that is available to residence going to somewhere off the standard bus routes. It is like having a cheap limo service at your disposal. They will take assisted living residents anywhere in the city. Although the Pearl street mall is the center of the retail business district, both north and South Boulder have small mixed-use retail areas. Almost all these area have a coffee shop and grocery store so it is easy to live a pedestrian lifestyle in Boulder. The Pearl Street area is home to several 5-star restaurants and includes a diverse variety of cooking styles including great Sushi, French, Italian, Indian, and Cajun food. Approximately half the population of Boulder is students at the University of Colorado. The school has helped keep Boulder a young, athletic and heath conscious town. This youth and academic influence result in a great place to live for assisted living residents. CU has a great Football team and the new stadium that has all levels of seating so you can purchase season box seats if you are a major football fans. The school also has low-cost or free basketball, volleyball and baseball games. The university of Colorado also boasts a world-class library, a music auditorium and a play-acting theater. These activities can help keep assisted living residents active and enjoying life. Boulder has year-around festivals that make excellent activities for people of all age groups including assisted living people. The Boulder creek festival includes booths, free music, and lots of people watching. The Boulder farmer’s market is every weekend during the summer and focuses on organic and natural foods. In the fall, the entire Rocky Mountain area is vibrant with the fall leaf colors. The Kinetics festival includes a human powered vehicle race on water, mud and land. This combined with a music festival make it an exciting spring event. Just because you are living in an assisted living facility, you can keep busy and active with all the great Boulder activities. If you have family living in other parts of the US where you don’t want to live, then Boulder is a great place to be an assisted living facility. By living in a tourist attraction, it is easier to entice your family come to visit and get them to stay longer. 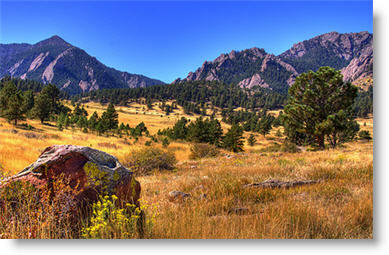 During the winter, Boulder is only about 30 minute from Eldora Ski Resort. During the summer, many tourist stay in Boulder and drive to Estes Park, The abundance of activities including hiking, biking (you can rent bike at university bikes), rock climbing, cross country skiing, downhill skiing, camping and shopping make Boulder a great attraction for your friends and family. Boulder even has World-class 5 star lodging like the Saint Julian, the Boulderado and B&Bs like the Briar Rose. As a senior in an assisted living facility, health care is definitely one of the highest priorities. Boulder boasts a new centrally located state-of-the-art hospital at Arapaho and Foothills Parkway. This beautiful new facility includes a cancer treatment center. Since all of Boulder is health conscious, you will also find an unusually high population of message therapist, acupuncturist, chiropractors, Chinese herbalist, upper cervical specialist and other alternative doctors that can have solve problem that traditional medicine cannot solve. Boulder also boasts a variety of cultural attractions that can also spice up life in an assisted living facility. The Boulder dinner theatre, the Boulder Theater, and the Fox are all public venues for indoor events. For even more cultural options, Denver is a 30-minute drive. Last but not least, Boulder is a great place for assisted living because the area also has a good selection of independent living and nursing homes. For those that are on the mend, moving to an independent living facility is a logical step from an assisted living facility. The amenities, social activities and instant emergency help make independent living a safe and fun option for those that want to keep living a full life and want the insurance and daily stimulation that are only available at independent living facilities. If you have more serious heath problems, you may also plan ahead and select a neighboring nursing home. Boulder has a great selection of both nursing homes and assisted living facilities. The Boulder Meadows is an example of an up-scale independent living facility. The current wait list for the facility is over one year so you need to plan ahead are interest in this business. Boulder also has a excellent senior center located at the East Boulder Recreational Center. This senior center organized year around activities for seniors include those from assisted living facilities. For some senior cold weather is a prohibitive factor when looking for a retirement area or assisted living area and those people may not appreciate Boulder. For many other seniors Boulder, Colorado is one the most enjoyable and healthy places to be in assisted living. Results Limited to 44 for download speed reasons. See More Boulder assisted living facilities. 2762 Bella Vista LnBoulder, CO 80302 At The Academy, we are devoted to creating exquisite environments for seniors. Both of our communities have one-of-a-kind ambiance and style. 1055 Adams CircleBoulder, CO 80303 Our income-restricted apartments are one-of-a-kind thanks to the surrounding landscape. 3375 34th StBoulder, CO 80301-1987 Brookdale Boulder Creek, formerly Wynwood at Ridge Point, is a Boulder, Colorado Assisted Living community for seniors. It?s located near its sister community, Brookdale North Boulder, an Independent Living Community for seniors. 1244 Gillaspie DrBoulder, CO 80305 The Mary Sandoe House is located in South Boulder conveniently near several other assisted living facilities. 4755 Shawnee PlaceBoulder, CO 80303 Shawnee Gardens is happy to announce that our backyard chicken coop is completed. 1855 Plaza DrLouisville, CO 80027-2325 In Balfour's assisted living residences, known as The Villa, life is arranged with as much individuality as possible. 225 Waneka ParkwayLafayette, CO 80026 The Legacy at Lafayette is a beautifully appointed home designed for an active senior lifestyle with wide hallways, no steps, and private apartments. Our home is dedicated to creating a warm, cheerful, and attentive atmosphere for seniors in the Lafayette area. 10190 Wadsworth BlvdWestminster, CO 80021 One of our Premier Communities, Church Ranch is home to 55 residents. The Retreat at Church Ranch first opened its doors in 1999. We have provided seniors with high-quality, personal services to improve the safety and quality of their lives. 2240 Pratt StLongmont, CO 80501-1497 Sterling House of Longmont located provides personalized Assisted Living services for seniors. We place an emphasis on providing a wonderful assisted living lifestyle, allowing you to do what you can and helping you remain as independent as possible. 3555 Dudley StreetWheat Ridge, CO 80033 Ashley Manor was created to make a difference in the lives of those suffering with memory loss and their families. 4115 W 38th AvenueDenver, CO 80212 We are dedicated to serving the community through the provision of affordable, high quality living accommodations and services to low and moderate income elderly.